News & Events B - Equal Rights Amendment No Time Limit on Women's Equality! From left to right are: PPPPPPPPP, Ms. Carolyn Cook, and RRRRRRRR. The Montgomery County Business and Professional Women honored Carolyn Cook, Founder and CEO of United 4 Equality, LLC as the "2011 Woman of Achievement" on Thursday, October 20, 2011. The ceremony took place at the Gaithersburg, Maryland Holiday Inns in Montgomery County. Councilmember Yvette D. Alexander (Ward7). The D.C. Council re-engaged in a decades-old fight Monday when it unanimously approved a resolution calling for the passage of the federal Equal Rights Amendment to the U.S. Constitution. 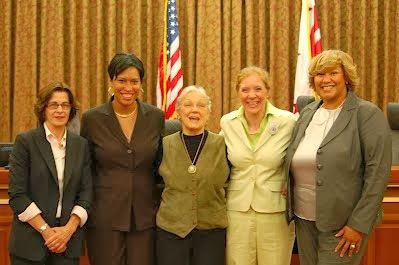 The resolution was sponsored by council members Muriel Bowser (D-Ward 4), Yvette D. Alexander (D-Ward 7) and Mary M. Cheh (D-Ward 3), the three women who serve on the council. In arguing for passage of the resolution, Bowser recounted the history of the amendment, which was first devised in 1923 by suffragist Alice Paul. The House and Senate both approved the amendment in 1972, but it was never ratified by two-thirds of the states. Although Bowser noted that the District has among the toughest anti-discrimination protections in the nation, she called on her colleagues to take a stand for women in other states. “It’s not the law across the country, therefore, this resolution gives additional attention and much-needed focus to this important body of work,” Bowser said.